Image courtesy PhotobucketElena Kagan, President Obama's Supreme Court pick, has a lot of people wondering about how her personal life will affect her decisions. This blogger (and mom) wishes Obama had chosen a mom for the Court to give it a level of insight she feels is missing. 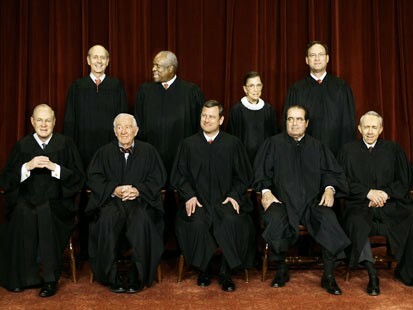 For another blogger's perspective (also a mom), read The Supreme Court Doesn't Need Another Mom. I'm not going to mince words: The Supreme Court needs another mom. Not the kind that'll make Clarence Thomas a peanut butter and jelly sandwich or remind John Roberts to clean his room! What the Supreme Court needs is more of a mother's perspective. Don't get me wrong. I'm happy that President Obama nominated another woman to the Supreme Court with his selection of Solicitor General Elena Kagan. It sure will be nice to see three people in that annual "get out the good judicial robe" photo who look sort of like me. Interestingly though, after Justice John Paul Stevens announced his impending retirement, some columnists started writing about this crazy idea that maybe, just maybe, the Supreme Court nominee to replace Stevens ought to be a mother! Justice Ruth Bader Ginsburg has fought the good fight, especially with the language of her dissenting opinions, in calling out her fellow justices in their attitudes toward women, but she’s only one vote. And she’s 76. She needs some back-up. I’d like to suggest that a mother who still has children at home (or isn’t too far out from that experience) could provide an interesting peek into the intersection of judicial ivory towers and real life -- someone who is still living the daily reality of what it means to be the one in the family who brings home the bacon, fries it up in the pan, and makes sure the grease doesn’t get poured down the sink because she’ll be the one who has to take time off from work when the plumber has to come and snake the drain. Someone like that could be a powerful voice of reason when it comes to getting the remaining members of the Supreme Court to remember that there is a place for the law to intersect with real life. In raising the question this time around, Irin at the blog Jezebel asks, "Does it really matter if the woman nominated is a mother?" In a word -- yes. A woman who also knows the realities of being a working mom and, most likely, has made less money at some point in her life than her male counterparts would've brought a perspective to the Lilly Ledbetter case that might have changed the outcome for her. Sure, the President signed the Ledbetter Act into law a couple of years later, but that didn't get Lilly any of the $365,000 in back pay and benefits that her employer should've paid her. A woman who's faced issues with pregnancy complications -- or who has sisters or friends who've dealt with the same things -- could have been a powerful voice that might have convinced some others that there's more than one way to look at late-term abortions. Many Republicans scoffed during the Sotomayor confirmation hearings about the role that our personal experiences play when it comes to applying the law. But laws don't exist in the vacuum they'd like us to believe they do. Sometimes laws have to be interpreted. Believe it or not, there's nuance and subtlety to the law. If there wasn't, we wouldn't need lawyers or judges or a Supreme Court! And without relying on our personal experiences and stories, there's no context for interpretation or application of the law. And that's why I say the Supreme Court needs another mom. Because I know the lens through which I viewed things like gender discrimination, reproductive rights, and a whole host of other issues did change after I became a mother. Things that happened to me after I had a child have impacted my perspective -- and I'd like someone on the Supreme Court to be looking at cases about those issues who's had some of the same experiences I have. It's not really just the Supreme Court we're talking about here. It's all high-powered professions and appointed government positions that still sorely lack any critical mass of mothers in their ranks, especially mothers of young children. I'd like to see some moms' perspectives there too. Say, like in the House of Representatives. And the Senate. And the President's Cabinet. Alas, it's not to be this time around for SCOTUS. But I'm really not crazy when I say the Supreme Court needs another mom. After all, didn't your mother usually have good reasons for her decisions? Joanne Bamberger's book about how mothers and social media are revolutionizing the world of political involvement will be published this fall by Bright Sky Press.